Being a Moral Crusader is a great gig in that you get the best of all worlds, public acclaim and a luxurious lifestyle just for self-righteously calling on others to meet the moral standards that you define. 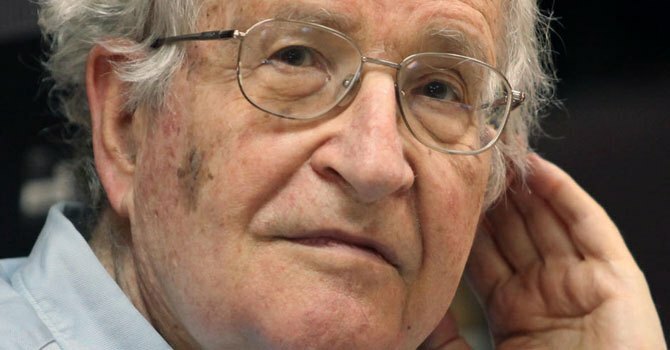 Enter Noam Chomsky who according to Wikipedia “in his youth developed a dislike of capitalism (a “grotesque catastrophe”) and the selfish pursuit of material advancement”. He laments the increasing inequality resulting from the gutting of finance industry regulation and warns of an “unaccountable and deadly rule by corporations.” But amazingly he’s managed to become a highly successful capitalist himself, making millions of dollars through adroit management of Brand Chomsky. Books represent his biggest earner by far. He churns them out on an industrial scale (they’re largely rehashes of earlier speeches and articles) and charges a hefty capitalist price for them. As he does for his speeches. If you want him to deliver The Selfish Pursuit Of Material Advancement – one of his favourite lectures – your university will first have to fork out for the $15,000 fee plus the cost of First Class travel and a five star hotel that this horny-handed son of the soil insists on. And should you want to download material from his web site you’ll be met with this stern warning: “Material on this site is copyrighted by Noam Chomsky and/or Noam Chomsky and his collaborators. No material on this site may be reprinted or posted on other web sites without written permission.” Such permission being granted on payment of a hefty fee. And what about this: Following the 9/11 attacks he discovered that the demand for his learned opinion had, well, exploded. Despite his intense dislike of the “grotesque catastrophe of capitalism” he immediately jacked up his speaking fees by 30%. Don’t you just love that? And within weeks he’d churned out another book to exploit the disaster, this one purporting to explain its causes and significance. However on closer inspection (after you’d forked out your $40) you’d have learned that it was – yet again – made up of already published material spliced together with some hastily-written linkage text. And wouldn’t you expect him to invest the resultant fortune in a blind trust or better again in green eco-friendly stocks? Maybe, but unfortunately such companies offer poor returns and high risk. Unlike those for example in the military-industrial complex, Big Pharma or the oil companies. But that’s not an option given that he sees them as exemplifying the “grotesque catastrophe” of predatory capitalism. Oh wait – one quick intellectual somersault later and he’s plunged headlong into their stocks, greatly enriching himself in the process. And now he strides the intellectual firmament like a colossus, wealthy, feted, admired, a sought-after guest while remaining a champion of the poor and a defender of the environment. The long and happy life of a Moral Crusader. (More good stuff on Noam here). And here.